ST. CLAIR SHORES, Mich.- Photos of full-sized clay models suspected to be of the 2015 Ford Mustang have surfaced all over the web in advance of Ford Motor Company’s release. The photos are prompting all kinds of speculation by Mustang-devotees about what direction the design and engine configuration will be on the sixth-generation version. 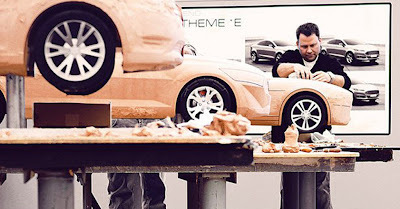 The photos feature four clay models shot evocatively behind a poster of an unknown Ford prototype, arousing debate over whether the poster foreshadows the 2015 Mustang or a different model. The pictures have aroused comparisons with some of the classic Mustangs; although, if they are similar to the final design, the lines should appear quite modern. The design of the much-anticipated 2015 model is not the only aspect that has sparked considerable buzz—there is also controversy surrounding the rumored four-cylinder engine option and whether it is going to be offered in the U.S. market or European markets. Whichever way the designers at Ford decide to go, you can expect the finished product of the sixth-generation 2015 Mustang to be on the circuit in 2014, possibly showing its face around the middle of April. Check back later to learn more about the 2015 Mustang, check out the current 2013 Ford Mustang Brochure, or visit Roy O'Brien Ford to see our entire line of Ford vehicles. Family owned and operated since 1946, Roy O'Brien Ford is located at 22201 E. 9 Mile Rd. St. Clair Shores, MI 48080 for all your Metro Detroit Vehicle needs. 2015 Ford Mustang: Turbocharged Four-Cylinder?